Hover over the form below and click for more information. You will find your account and invoice number here. 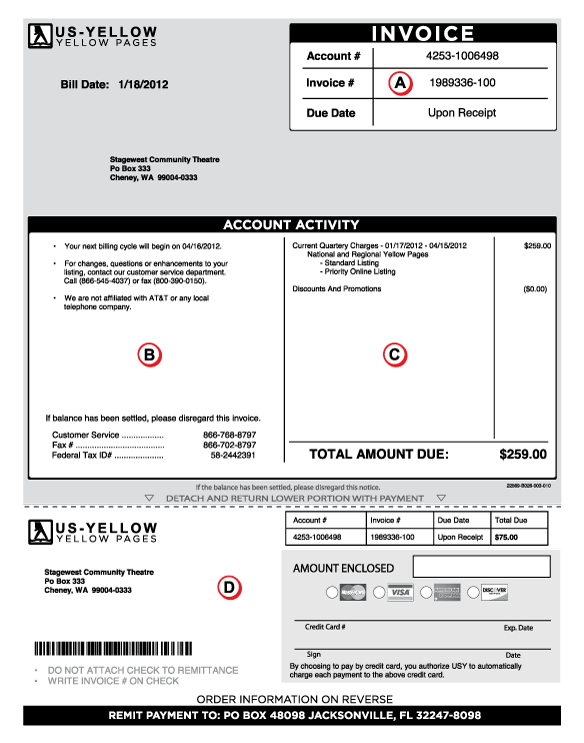 The bill date & amount due are also shown. In this section you will find a summary of charges owed. You will also see any discounts or promotions available. You can find the total amount due in bold. If you have any questions about your listing or bill, you can contact the customer service number at: 1 (866) 752-8797 . Should you choose to discontinue your service with us, please see our cancellation policy. In this section you will find when your next billing cycle will start. If you have any questions about your listing or bill, you can contact the customer service number at: 1 (866) 752-8797 . You will also see a reminder that we are not affiliated with AT&T or any local telephone company. Our fax number ( 1 (866) 702-8797 ) and our tax ID information (# 58-2442391) are also listed in this section. You will see all your account info again, but this time with payment information. You can choose to pay by credit card or enclose a check with your remittance. If you choose to pay by check, make sure to write the invoice number as a reference. To make changes to your listing, fill out the reverse side of this panel.